I saw a turkey sock puppet on Pinterest and had to try it. I put my own twist on the craft and got excellent results. I did this craft with a group of 20 kids ages 6-14 and they all loved it. 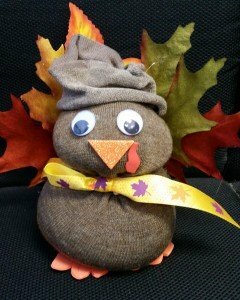 It was simple and makes a great decorative Thanksgiving craft. Follow the step-by-step directions below to make your own. Step 1: Pour 1-2 cups of rice into the sock depending on the size of the sock, Then tightly wrap a rubber band around it. The bottom should be round and fat. This will be the turkey’s body. Step 2: Then pour half the amount of rice you used for the body into the sock. This will be the turkey’s head. Make sure you tightly wrap a rubber band around the head. Step 3: Depending on the size of your sock you can have a lot of a little of the sock left. You need about three inches of the sock to make the house. If your sock is longer cut it down. Then fold it down over the head, so it looks like a beanie hat. Step 4: Tie a ribbon around the first rubber band. Step 5: Glue googly eyes on. Step 6: Cut a beak, wattle and feet out of foam, construction paper or felt and glue them on. Step 7: Glue on the turkey’s feather’s. I used fake leaves available at crafts stores. You can also use construction paper, felt or fake feathers.